I’ve been told that Italy intensifies as you move farther south, and that Naples — the country’s third largest city — is Italy in the extreme. After spending just a few hours in southern Italy, I can pretty much concur. The rest of Italy feels candy-coated compared to the south. 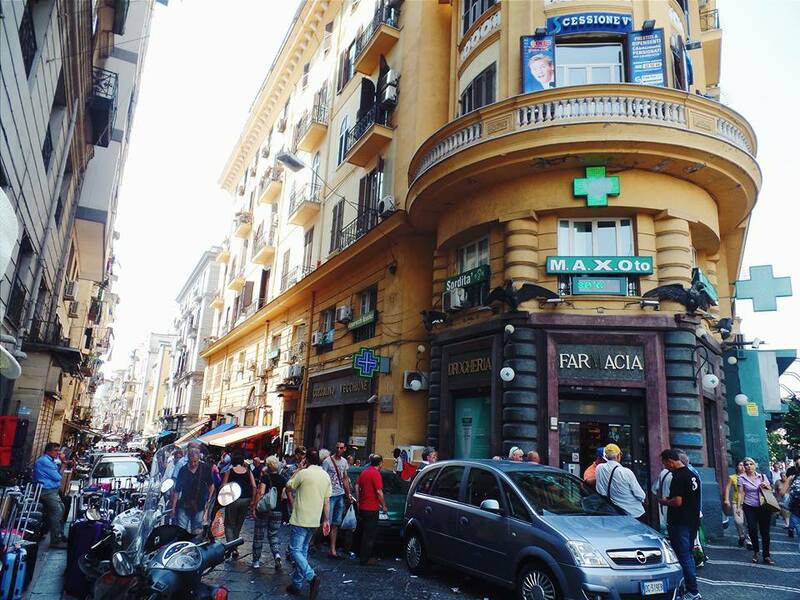 If Rome‘s grittiness is too much to handle, Naples probably isn’t the city for you. But for the adventurous traveler, it offers plenty, from archaeological sites to mindblowing pizza. My obsessive planning skills were useless here, but I slowly learned to embrace the chaotic beauty of southern Italy. Even our train ride to Naples seemed more disorderly than all our other train rides. When we boarded our final Trenitalia in Rome, we initially couldn’t find our car because the seating assignments were different. Instead of rows throughout the whole car, there were a few enclosed compartments. We were still standing, perplexed, when the train started moving. Eventually, we figured out how to decipher the seating and joined four other people in a compartment. If you look closely, there are three people on that little moped. Typical transportation in Southern Italy. After a few train stops, only a man and a teenager remained in the compartment with us. The man was on his phone the whole time and even fulfilled our Italian stereotype by exclaiming “Mama mia!” at one point in his conversation. The teenager, realizing immediately that we were tourists, excitedly pointed outside to things we should look at, such as a group of kite surfers and the glittering sea in the distance. He couldn’t speak much English, but we attempted to show our appreciation for this free, private tour by “ooh”-ing and “aah”-ing. Little moments like these — the mutual understanding, enthusiasm, and consideration shared despite language and cultural barriers — were some of my favorite experiences in Italy. Even the other man, despite not interacting with anyone during the ride, said “Ciao” to the teenager and “Bye” to us before leaving the train. 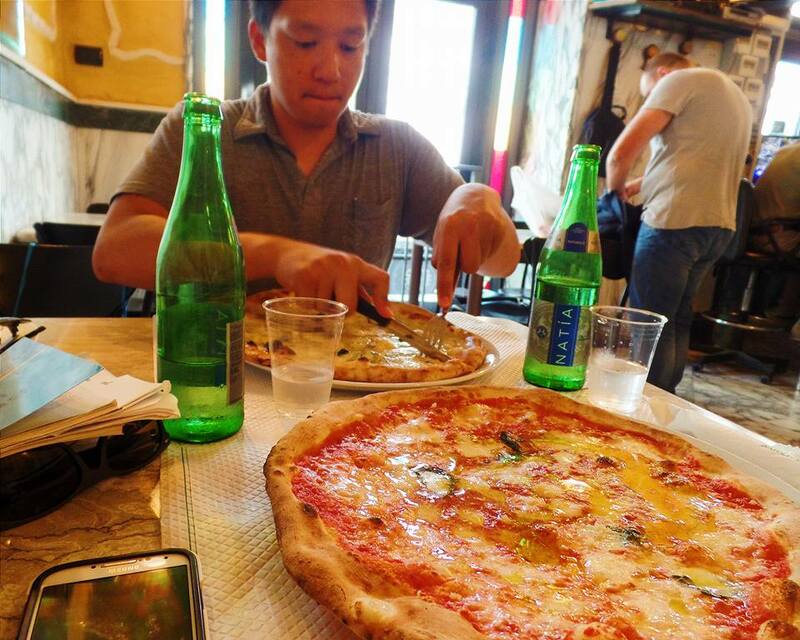 No matter how little time you have in Naples, eating pizza is a must. Neapolitan pizza is indisputably the best in the world. While New York has done a fair job imitating the Neapolitan style, the prices in Naples can’t be beaten (but I encourage you to try, New York!). Unlike pasta, pizza in Italy is really hit-or-miss. We’ve had an awful one in Venice and decent ones in Rome. 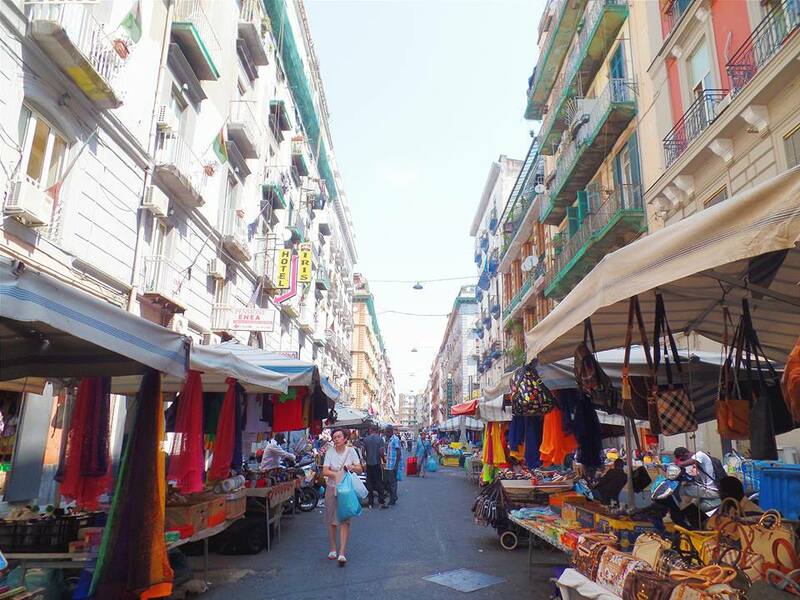 Fortunately, there is no gamble in Naples. We squeezed through crowded streets to a pizzeria called Trianon. I was surprised by how fancy the restaurant looked, with bright yellow walls, mirrors to open up the space, and marble tables. 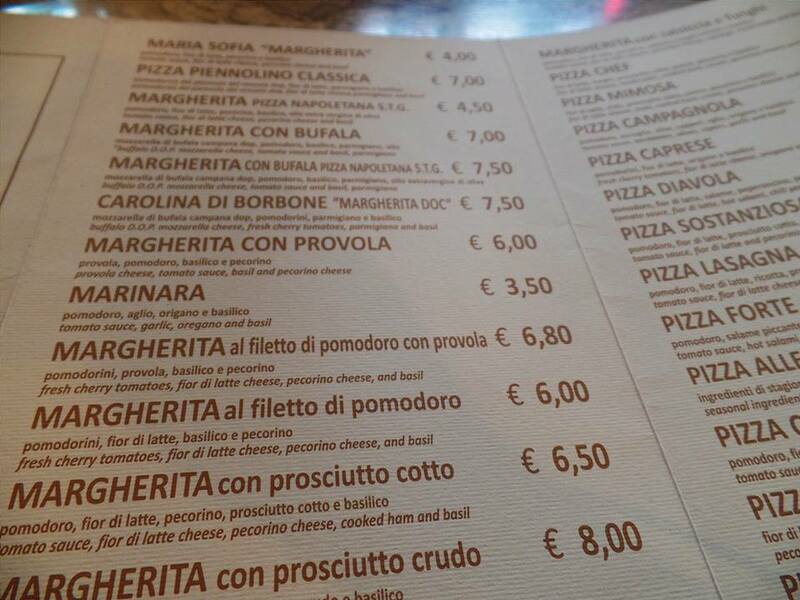 Nevertheless, the prices were just what we had hoped. We each ordered a pizza, which was ambitious, since one pizza could have stuffed both of us. As expected, they were some of the best I’ve ever had. Authentic Neapolitan pizza consists of wheat flour with a high protein content, San Marzano tomatoes, and only a smattering of fresh mozzarella. The dough must be kneaded by hand or with a low-speed mixer, then formed by hand — not with a rolling pin or other tool — into a thin crust. It is baked for about a minute in a stone oven with an oak-wood fire. When served, the pizza should be soft, floppy, and extremely aromatic. My mouth is watering as I type this. We couldn’t leave behind such good leftovers, so we asked for a takeaway box and headed back to the station. We then embarked on the most miserable train ride in recent memory. To go south from Naples, we caught a cheap commuter train called Circumvesuviana. The company gets its name from Mount Vesuvius, the infamous volcano around which it runs — hence, circum-vesuviana. The train station was a mess. There were dozens of tourists trying to get to Pompeii, just like us, but no one seemed to know which train to catch, since signs were confusing and the trains were not labeled. Some local teenagers were waiting at the platform as well, doing typical dumb teenager stuff — shouting, standing at the very edge of the tracks, and sidling up close to certain passengers. You could sense all the American tourists nervously clutching their belongings. We somehow figured out which train was correct and began the sweltering 40-minute ride. The train was packed and had no air conditioning, just some tiny windows at the top. We were crammed into a corner, still holding onto our pizza. About halfway into the ride, however, a little girl started singing a Spanish song that her dad was playing with a guitar. She didn’t have a great voice, but because of the somewhat dire situation, everyone appreciated it. Music lightened up the mood, while the desperation of the performing child pulled our heartstrings and, what a surprise, made me fall in love with southern Italy a little more. 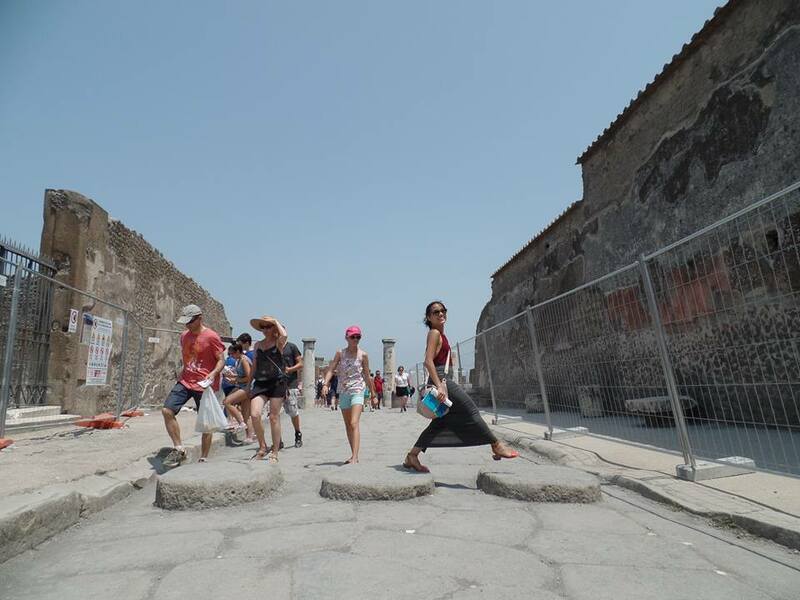 We got off with the other tourists at Pompeii. 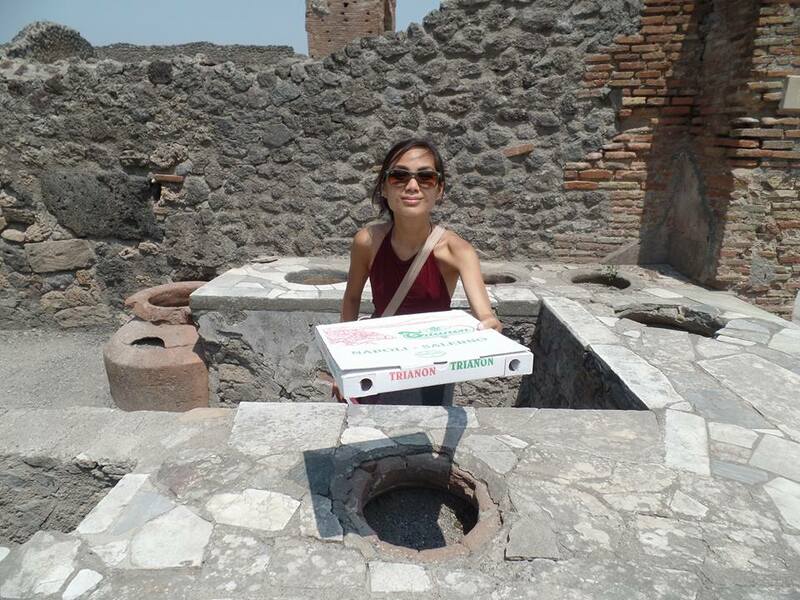 The “left baggage” department wouldn’t let us leave our pizza with them, so we ended up carrying it around Pompeii, which is a bit ridiculous considering ancient ruins should deserve more protection than a random air conditioned room by the entrance. Nevertheless, we carried that pizza through Pompeii’s basilica, public baths, and one of the first fast food restaurants! 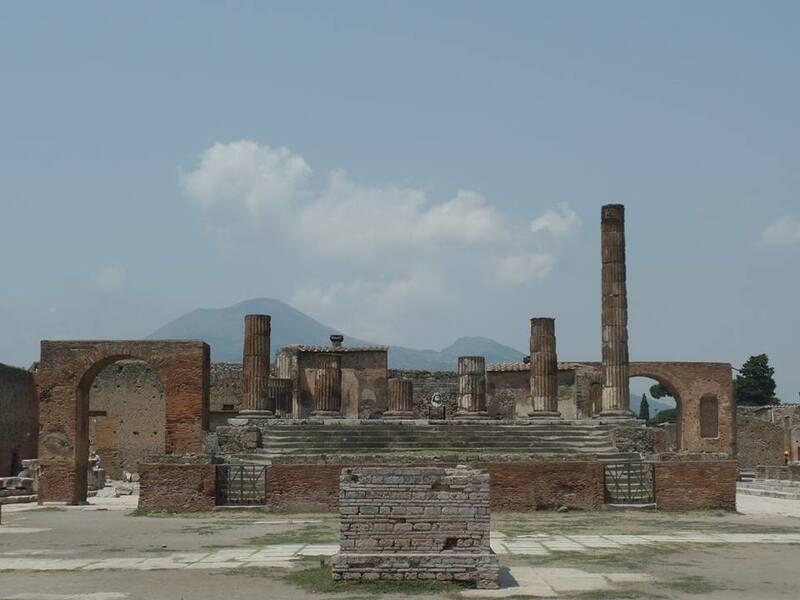 Pompeii was once a thriving commercial port, but in year 79, Mount Vesuvius erupted and buried the important Roman city under 30 feet of hot volcanic ash. All inhabitants were killed, and the site was lost for thousands of years. Historians love Pompeii because everything has been preserved due to the lack of air and moisture from the ash. These artifacts provide a perfect insight into the daily lives of middle-class Italians. Mount Vesuvius looms in the distance and is still regarded as one of the most dangerous volcanoes in the world. When it erupted, Pompeiians had no idea that they were living under a volcano, as Vesuvius hadn’t erupted for thousands of years. 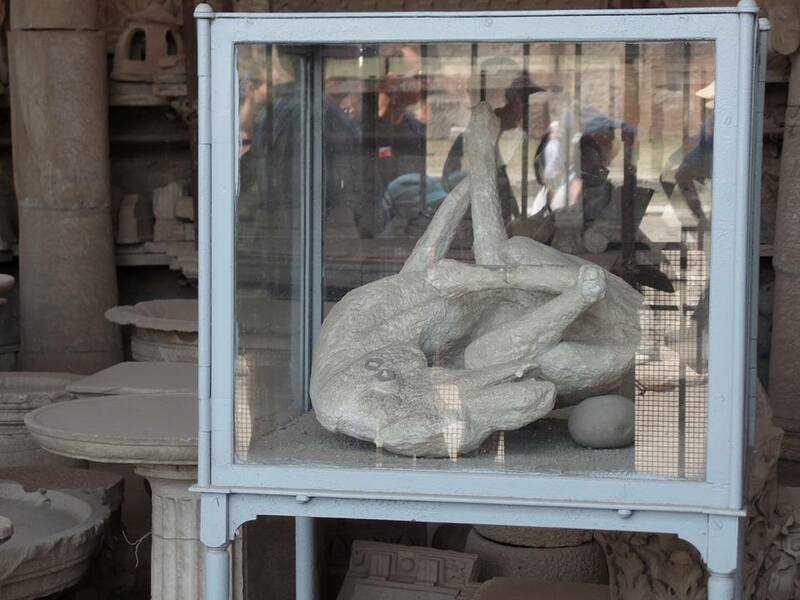 It spewed a cloud of ash, dust, and rocks for 18 hours straight, as winds blew the cloud southward, settling on Pompeii and collapsing roofs and floors. The level of engineering and urban planning that we noticed in Pompeii was astounding. Every day, Pompeiians flooded the streets with gushing water to clean them. Stepping stones let pedestrians cross without getting their sandals wet. Chariots were designed to perfectly straddle the stones. A single stepping stone in a road means that it was a one-way street, while a pair indicates an ordinary two-way. Three stepping stones signify a major thoroughfare. The sidewalks were studded with reflective bits of marble that helped people get around after dark. 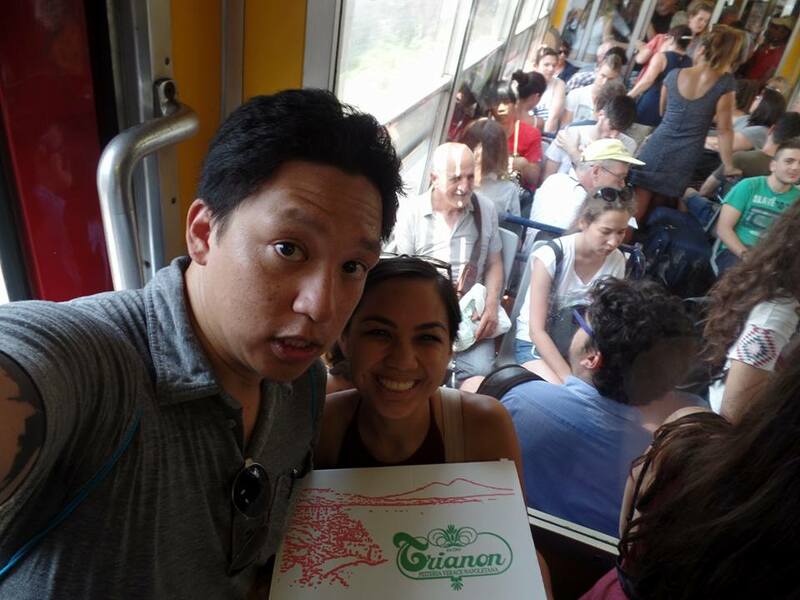 After Pompeii, we had to rush to Sorrento to catch a ferry, so we hopped onto Circumvesuviana again for a much more pleasant ride, thanks to strategically-placed windows that allowed air to gush in. Once we arrived in Sorrento, we had to climb down a long, zigzagging staircase to get to the port. Poor Anthony had to carry our suitcase down. When we finally got to the port, we were told that the last ferry to Positano was at 3:00, not 6:00 like Rick Steves said! I couldn’t believe that something went wrong in my impeccable itinerary! This had to be the most frustrating experience on our trip, as I hopelessly went to each ferry booth to confirm that there were no more ferries for the rest of the day. Instead of taking a ferry, we’d have to take a winding journey on a SITA bus to our hotel. I refused to make Anthony carry our suitcase up that absurd staircase, so we plopped ourselves onto a nearby city bus that takes people back to the train station. Of course, the bus driver took his time, waiting for more people to board. I was incredibly moody, and I don’t know what I would have done if eternally-calm Anthony hadn’t been with me. The driver finally shut the doors and dropped us off at the train station. We must have looked frantic because a kind Italian man asked if we needed help. A garbled “Dove stazione SITA?” was enough for him to point us to a SITA bus that was just about to leave. He confirmed that we were going to the Amalfi Coast and rushed us to the bus stop. The SITA bus driver must heard the helpful man’s shouts because he waited for us and shut the doors as soon as we scrambled up with our luggage. We made it! Southern Italy, I love you again. Ciao, Positano! Go with the flow. I struggled with this, as I couldn’t purchase our Circumvesuviana tickets or ferry rides in advance. But just know that everything is going to work out. You’ll eventually find the right train platform, you’ll eventually get to your destination. No one is in a rush in southern Italy, and, besides getting to Pompeii before it closes, there’s no reason you should be in a rush, either. One thing you’ll notice as an American traveler is that the worst thing that can happen to you (e.g., getting pickpocketed) is probably your own fault. 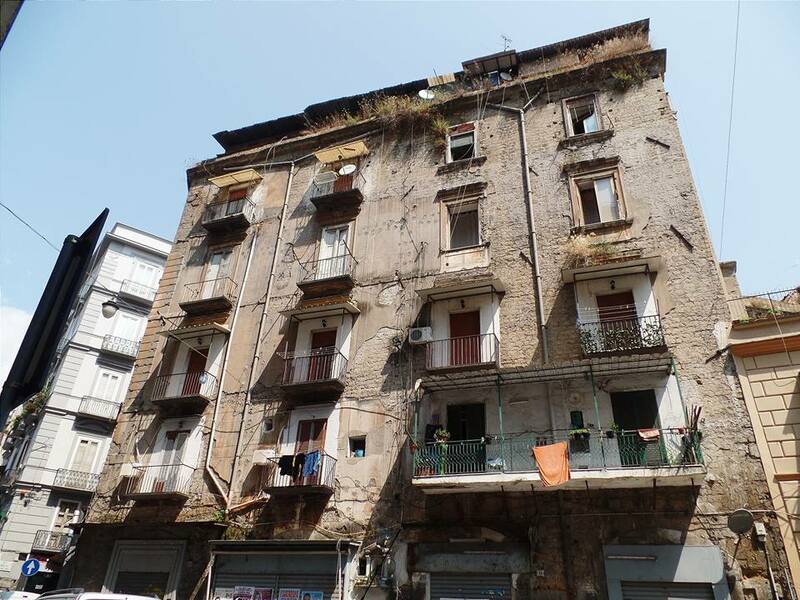 Southern Italy gets a bad reputation, thanks to its overwhelming poverty and America’s obsession with the Mafia. 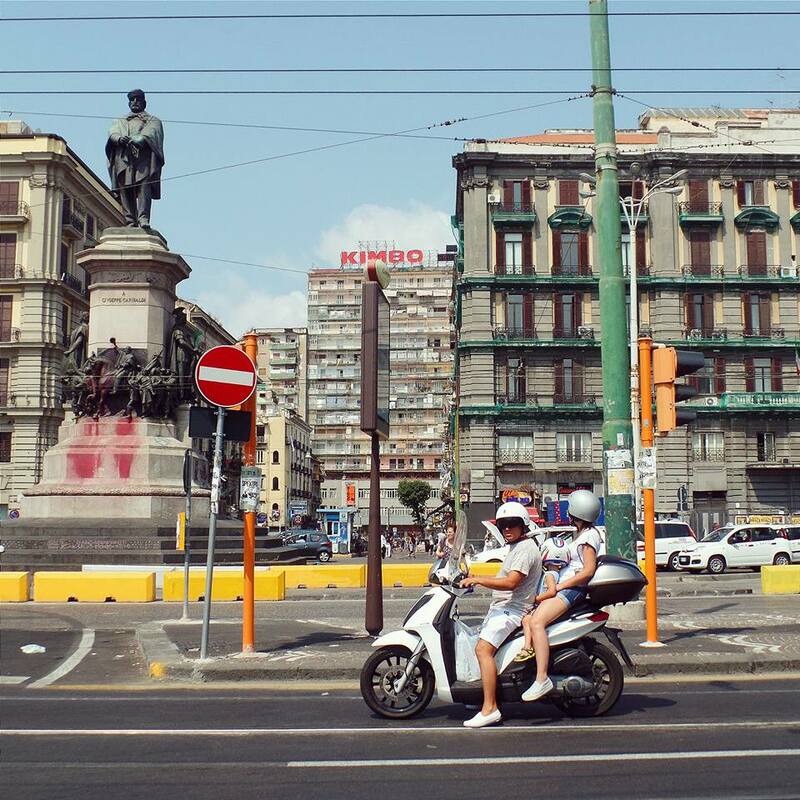 However, the Italians we came across in Southern Italy were some of the most charming people on our trip, and it’s a shame that such superficial stereotypes discourage many tourists from exploring places like Naples. Southern Italy is real Italy, after all.